Okay, so it's been awhile. Sorry about that. April and May have been crazy so far, but in the best possible way. 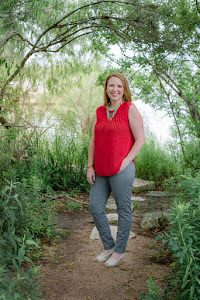 We've been having fun and hitting milestones and my Stella & Dot business has taken off and then some. I have NINE trunk shows in May and I am having so much fun! We've had sweet time with our kids, Grant's parents came into town for a fun visit, and Jack has been growing like a weed. 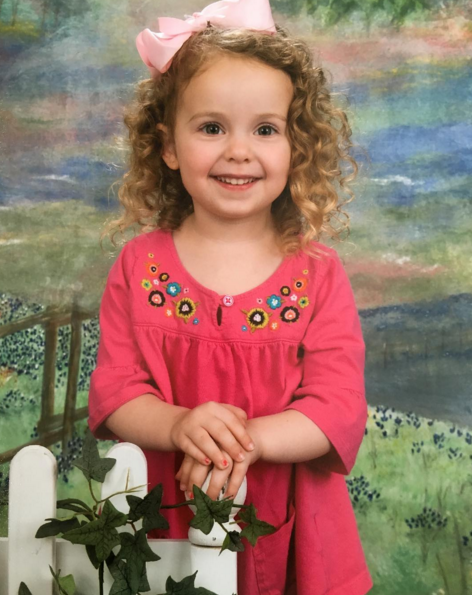 Speaking of that Ellie girl.... we got her Spring pictures from school and I legit started to tear up. She's grown and changed so much this year. 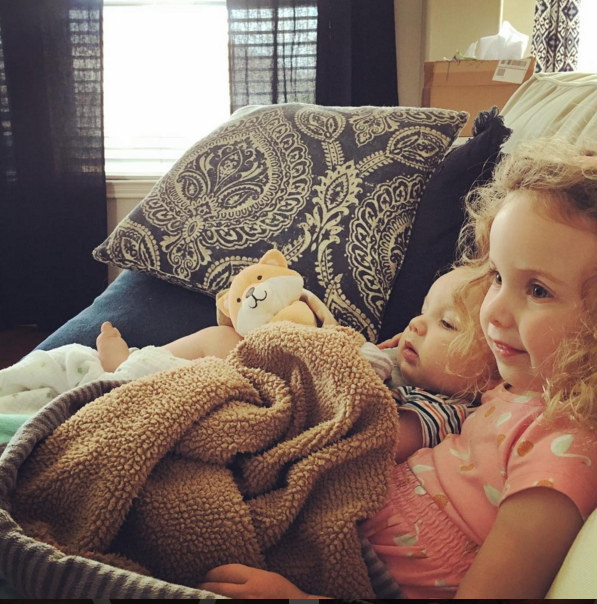 She's so much fun and she says THE FUNNIEST THINGS and she has a million questions but she's learning and it's a privilege to watch her grow. Yesterday she hollered from upstairs, "MOMMMMYYYY!!!! MOMMY!! HEY! DO YOU WANNA COME UPSTAIRS AND SMELL MY FEET REAL QUICK?!?!?!" We've hit a major milestone over here in that Jack can now sit up in a grocery cart, GOD BLESS AMERICA. He's pretty happy about it too. 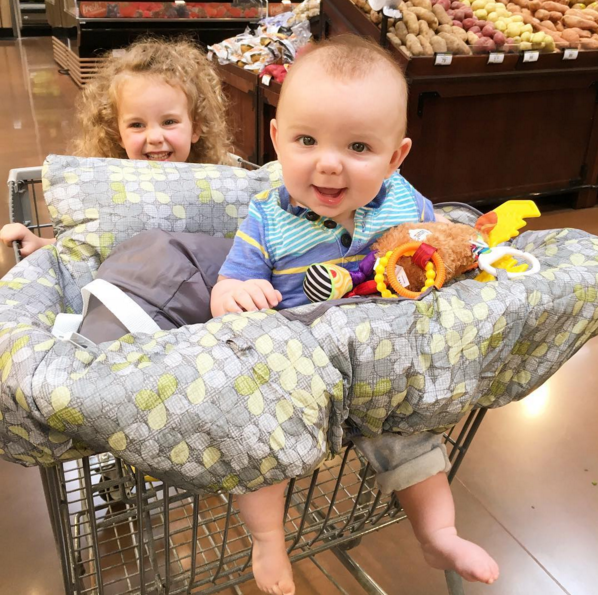 Grocery shopping has been a challenge these last few months but I think it's gonna get a little easier now that these two sweet potatoes are sitting up and we aren't taking up an entire grocery cart with that giant carrier. The other night, Grant ran outside and brought this ENORMOUS frog to the window. 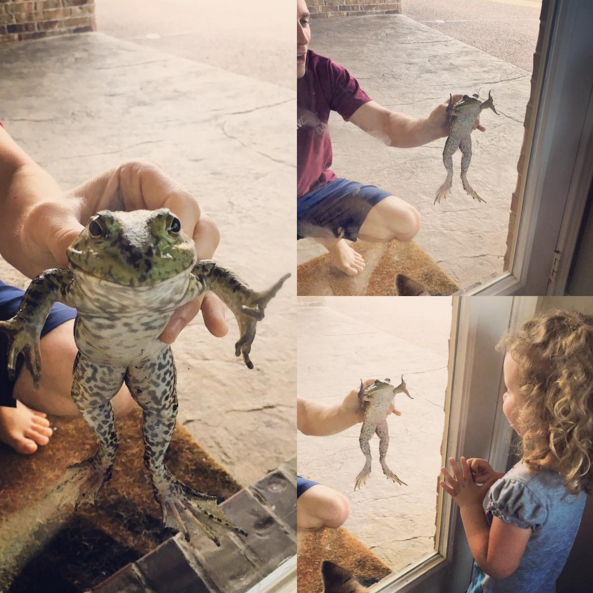 Ellie was intrigued but very much wanted that frog to stay outside. Mama did too. We also have bunny rabbits in our backyard and we recently had a turtle in our driveway so basically I'm like Snow White and all the woodland forest creatures flock to me. I am very snow white and could desperately use a tan but that hasn't happened in over 30 year so I don't think it's gonna start now. 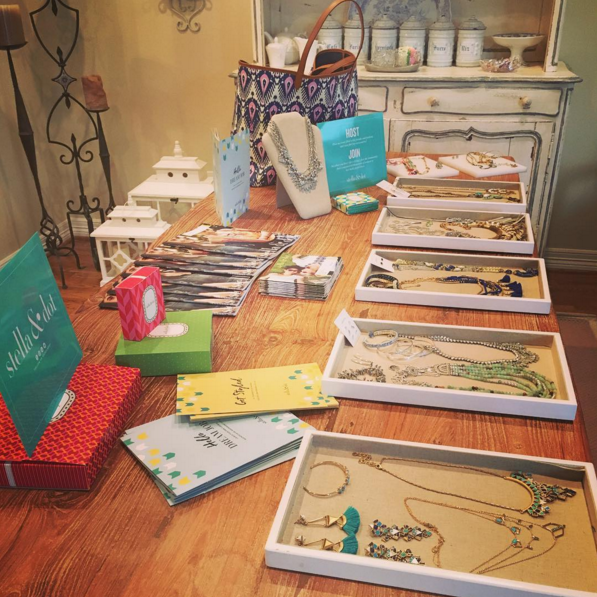 A few weeks ago, my BFF Lindsee graciously hosted my first in-home (I do some Facebook shows too) Stella & Dot trunk show. It was SO much fun. I mean I know I'm technically working but it's also a girls night. A girls night I get paid for. WIN WIN. 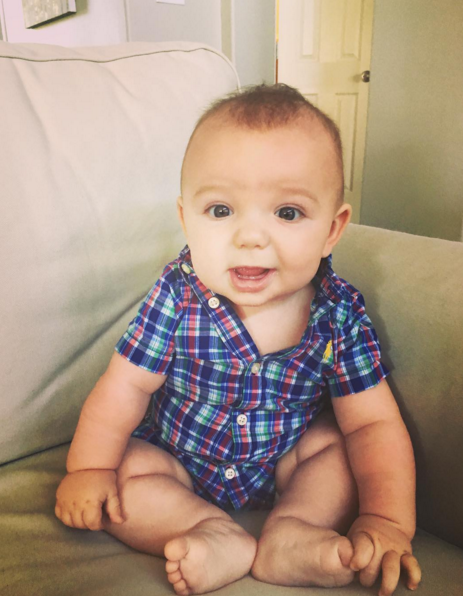 And yesterday we took this chunk to his 6 month check up BECAUSE SOMEHOW HE IS 6 MONTHS OLD NOW. HOW?!?!? He is doing great and he's a big boy and he sleeps well and eats well and he's gonna be crawling soon, I can tell. He's much more physical than his sister was so I am buckling my seat belt. 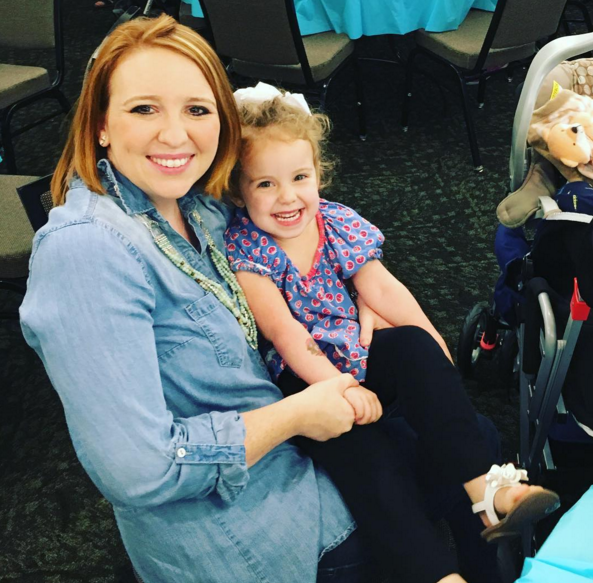 I just got back from a Mother's Day Tea at Ellie's school this morning. We had french toast and fruit and muffins and tea and coffee and our littles gave us a sweet card and another little handmade gift. I'm so thankful to be the Mommy of this little love bug. She's nothing but joy. Well, nothing but joy and questions.